When Mike and I took a really memorable ride a while ago, we found ourselves at the end of a dead end road, complete with very large barking dog straining at its rope, with lunch on his mind. The house we saw, guarded by an unseen but obviously vicious and hungry canine, was fairly typical of the area. What made it notable was the artistry at the base of the chimney. "I wonder where the people are who do this kind of work?" I asked Mike. "Dead! was his unfortunately likely correct response. We stopped at a library Mike had found in his research for this ride, and we did what we are driven to do every time we ride together. Mike has just taken his photo of me as I wait for the little blue and green frames in my new camera to tell me something in the viewfinder is probably in focus. 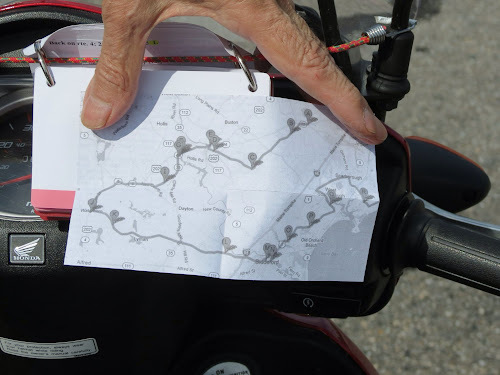 ... then the directions, printed on file cards and mounted on his Honda Elite. Even with all this, plus Mike's GPS phone - I have always managed to take a wrong turn. If I'm riding in front I go left, or south, or up, when I should have gone right, or north, or down. Then Mike hauls out the Big Book of Maps, and brings us back on course. 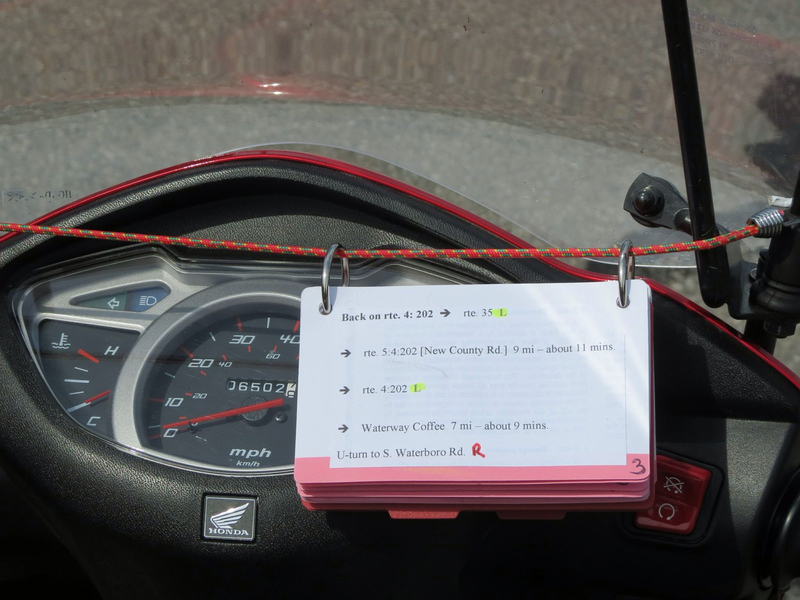 I really like your low tech GPS. Well, it works, it's cheap, and it fits under the seat. 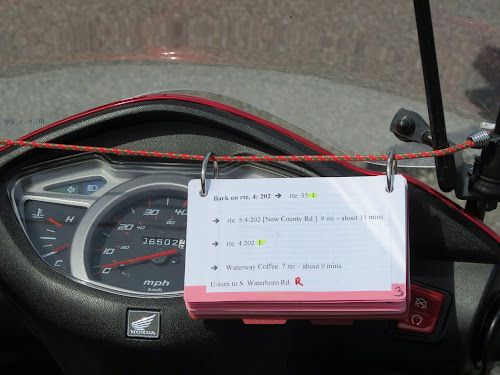 Great idea with the directions on the file cards. I always let someone else lead. I think I'd get us lost too. We usually have our big benchmark map book of Oregon which saves the day. With just the two of us, we are equal opportunity pathfinders or detour finders. 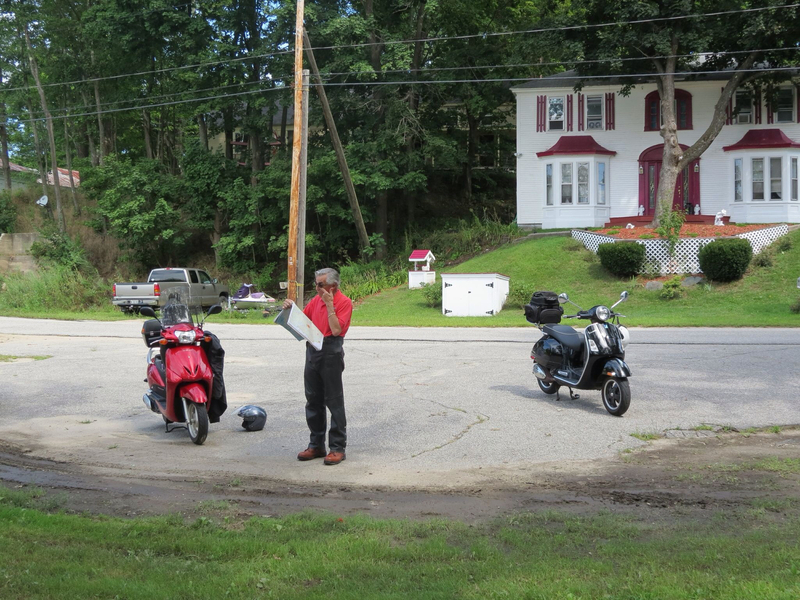 And Mike can always find great food and coffee - with or without maps, cards, GPS. 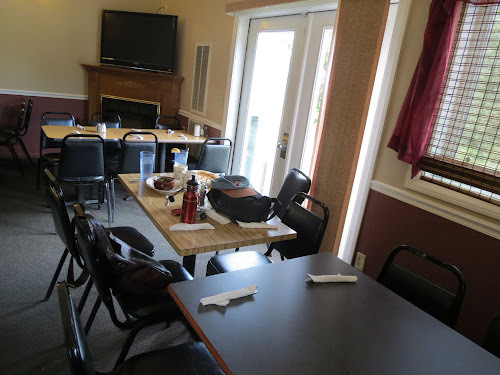 We may not know just where we are, but we always eat well! 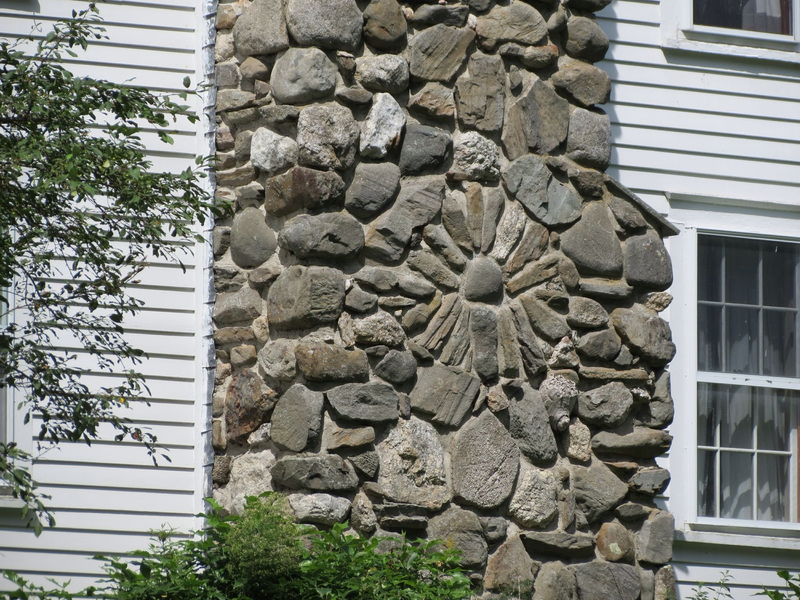 I bet there are people who still do that kind of stone work up there. We have many craftsmen and women who do that in our area. I never really have to worry about directions when I ride. If I go too far N,E,W I fall into the water and south is the highway and my little scooter won't go there! I'm sure there are true artists all around. But it's apparent in the dullness of so much new construction that people would rather have their home, office building, schools, etc. fit in to the drabness of current culture that "creative" and "interesting " aren't concepts that are discussed. I like the idea of having a natural boundary to keep you dry! Thank you for not relating the fact that on the VERY FIRST turn of our trip, I zoomed us past the turn, necessitating a u-turn in the middle of a 3-way major roadway. 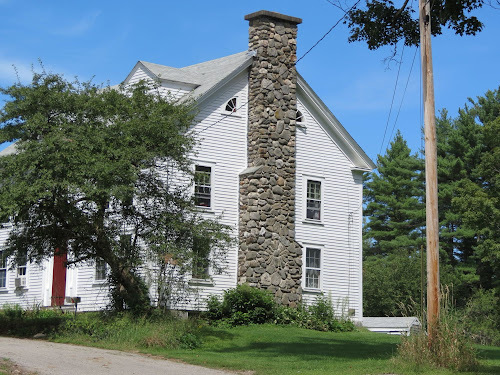 My BRW took one look at the chimney pictures and said, "Oh, they have a fireplace on each floor." Turns out those little slate thingys in the stonework, mark the location of a fireplace. Who'da thunk? I came close to bringing up that early missed turn, but the term "hypocrite" crossed my mind as a topic of comments. And regarding food - I appreciate your ability to guide us to the best eateries in the area. I see the windshield instructions have gone high tech and are printed now! Fancy! Based on the barking, I surmise that the source was a wolf/coyote/lion mix. 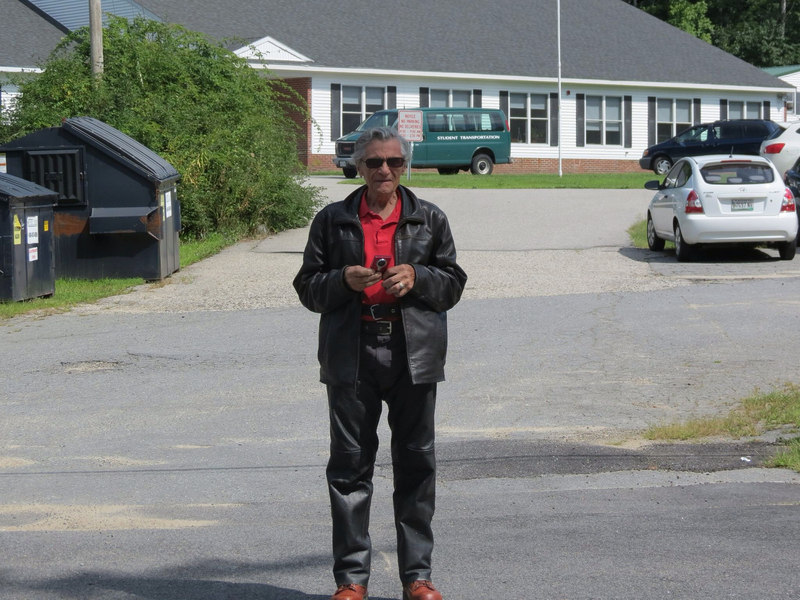 Very rare in Maine,and terribly dangerous. But obviously, Mike and I found the dwelling of this monster. I consider us lucky to have survived to ride another day. I think getting lost is a perfectly reasonable goal in itself. Since I seldom know where I'm going I seldom get lost, and often am amazed that I found my way. I ride through some of the oldest neighborhoods in St. Louis. I, also, ride sometimes out in the "new" wealthy parts with big mansions that are all different, but somehow manage to look the same. Sad. I agree on both comments - getting lost is a worthy goal, and it's sad to see the lack of creativity that dooms striving toward being different to everlasting sameness. Amen on that Thomas. Keith, too! New construction of plastic houses where the "artistry" is in what color vinyl you choose and how many roof peaks you can get on your house. Very well stated! In a hundred years, none of the "new" stuff will be standing, while the buildings that are one hundred plus years old today will still be here, and admired more than ever.